The Ghanzi and Boseto stratabound, sediment hosted copper-silver deposits of the Lake N'Gami district define the continuation of the Kalahari Copper Belt in Botswana, which stretches discontinuously for ~800 km along the south-eastern margins of the Damaran/Katangan rift basin, from central Namibia, extending into northern Botswana, to the vicinity of the Shinamba Hills. The Ghanzi and Boseto deposits are ~90 km SW of the town of Maun in northwestern Botswana. See the separate record for the continuation of the Kalahari Copper Belt in Namibia including the Klein Aub, Witvlei, Dordabis and Oamites deposits. See the separate Kalahari Copper Belt record describing the regional setting of the Klein Aub, Witvlei, Dordabis, Oamites deposits in Namibia, but also the broader stratigraphy and setting of the Damaran Supergroup that includes the stratigraphic units described below. The Kalahari Copper Belt deposits in Botswana are located within the Ghanzi-Chobe Fold Belt, a 140 km wide zone of deformed metavolcanic and metasedimentary rocks, which forms part of the late Proterozoic, Pan African Mobile Belt. The rocks of the Ghanzi-Chobe Fold Belt that host the copper mineralisation are part of the Ghanzi Group, a ~5500 m thick sequence of sedimentary rocks that is exposed along the NE trending Ghanzi Ridge, which extends over a strike length of at least 200 km, from the Namibian border towards Lake N'Gami. Over much of the surrounding area away from the ridge, the Ghanzi Group rocks are covered by Karoo or Kalahari sediments and are only observed in exploration trenches, drill core and traced via geophysical data and air-photo patterns. Lithologies along the belt exhibit a broad facies change from proximal coarse clastic sediments in Witvlei, Namibia, to clastic fine grained sediments between Ghanzi and Maun, to more distal limestone in north-eastern Botswana near the Shinamba Hills. 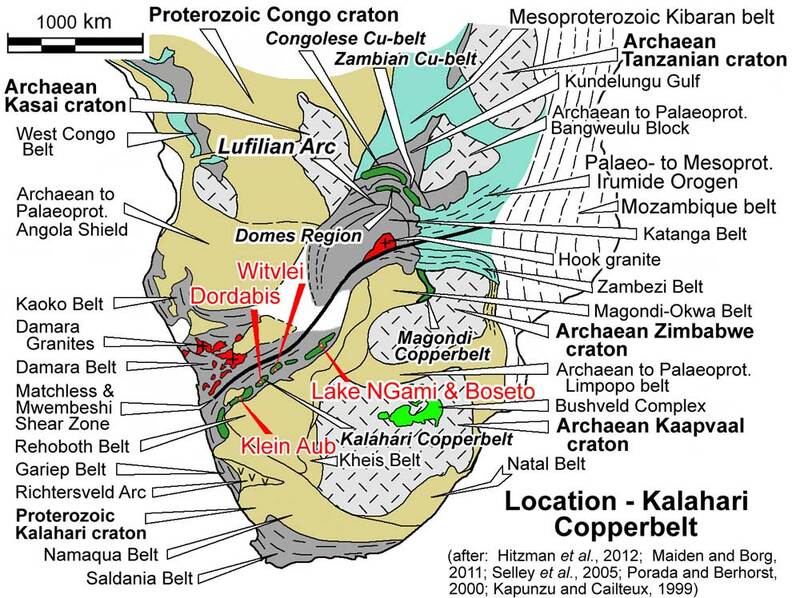 On the basis of lithology, the Ghanzi Group has variously been correlated with the Dordabis Supergroup or the Nosib Group, of the Damaran Supergroup in Namibia, and the Roan Supergroup of the Katangan System of Zambia and DRC. Kgwebe Formation - the oldest exposed rocks within the area, occurring in the core of a regional anticline. It comprises a ~2000 m thick volcanic succession of porphyritic rhyolites (1106±2Ma; Schwartz et al., 1996) and dacites, pyroclastic flow deposits, minor peperites and sub aerial basaltic lavas with subordinate flow breccias intercalated with minor epiclastic and tuffaceous sedimentary rocks (Kampunzu et al., 1998). Modie (1996) interpreted the formation to have been deposited in the initial rifting stage of an intra-continental rift basin, with post-volcanism thermal subsidence and down-sagging of the basin along bounding faults, having resulted in the deposition of fluvial and volcaniclastic sediments above the volcanic rocks. D'Kar Formation - which is ~1500 m thick, and is dominated by reduced facies, mainly parallel-laminated grey-green siltstones and mudstones with interbedded fine-grained sandstones (Modie, 1996; 2000). Minor thin (1 to 3m thick) discontinuous limestone beds and marls occur near the base of the formation. The lithologies are characterised by the presence of abundant fine-grained pyrite organic material, sometimes with sufficient carbon to be classified as black shales. Sedimentary structures are dominantly planar parallel lamination, which in the argillite units constitutes fining-upward pulses, indicating suspension deposition below wave base (Modie, 1996). Distinctive rhythmite units of repeated fining-upward pale siltstone to dark shale beds result from cyclic sedimentation between traction currents and suspended sediment load (Modie, 1996). Such rhythmites are regarded to be the product of storm activities, with thin and laterally extensive sandstone facies that represents high energy storm events. The interbedded sandstones are characterised by very thin interbeds of siltstone and shale, and by non-parallel curved layers and truncation surfaces, which are characteristic of hummocky cross-stratification (Duke et al., 1991; Walker and Plint, 1992). The limestones were deposited on a shallow shelf, in the upper offshore region, just below fair weather wave base, beyond the proximal foreshore siliciclastic shallow shelf of the underlying Ngwako Pan Formation, but with a clastic component where they commonly grade into, and are interbedded with, marls and calcareous argillite, (Master, 2010). The organic-rich black shales are interpreted to have been deposited in the anoxic, deepest part of the shelf, below storm wave base (Master, 2010). Mamuno Formation - ~1500 m of red-beds, mainly well-sorted, fine to medium-grained arkosic sandstone, interbedded with siltstone, mudstone and limestone (Litherland, 1982; Modie, 1996). Sedimentary structures include planar parallel lamination, cross-bedding, reactivation surfaces overlain by massive beds, ladder-back interference oscillatory ripples and straight-crested symmetrical ripple forms, indicating deposition in a near shore to shoreline environment, with active current and wave reworking processes (Modie, 1996a). There is no obvious break with the underlying D'Kar Formation with the contact reflecting a regression from a deeper water shallow shelf, to a shallower, high energy, near shore environments (upper shoreface to foreshore). The Ghanzi-Chobe Fold Belt rocks, although affected by Pan African Damaran-Lufilian orogeny deformation, have only been subjected to low grade metamorphism, mainly greenschist facies with the development of chlorite and sericite in the siltstones and sandstones with quartz-carbonate-chlorite filled veins. Spotted hornfels occasionally occur adjacent to younger mafic intrusives indicating local centres. The dominant structural trends within the Ghanzi-Chobe Fold Belt are NE-SW related to the Pan African Damaran-Lufilian Orogen, with the intensity of the deformation increasing towards the NW, where an axis of high temperature rocks, including as eclogites, and high pressure rocks such as talc-kyanite schist's are exposed and traced in geophysical (regional gravity and magnetic) data (John et al., 2003, 2004). Conversely, the intensity of deformation decreases to the SE towards the margin of the Kalahari craton. An early D1 deformation is expressed as a dominant F1 isoclinal fold phase, developed as a result of compression during contraction between the Kalahari and Congo cratons that resulted in basin inversion. Individual F1 fold axes can be traced for tens of kilometres along strike, trending NE-SW and are inclined, with northern limbs dipping at around 50°, and steeper southern limbs at from 70° to being locally overturned. As deformation progressed, the isoclinal folds became attenuated and overturned towards the SE, with stretching and structural thinning, and shortening and structural thickening, of the northern and southern limbs respectively. Early quartz veining and pyrite filled fractures are folded and boudinaged around these F1 fold axes. D2 is represented by WNW-ESE orientated F2 cross-folds, propagated by sinistral movement along thrust and shear zones parallel to the trend of the Ghanzi-Chobe Fold Belt. This oblique shearing created F2 cross-folds by buckling the original isoclinal F1 axes, and producing double plunging fold closures along their extent that plunge at shallow angles of up to 25° towards the NE, or SW.
Major dislocations, shears and thrusts appear to divide the fold belt into discrete blocks, and can be traced for tens of kilometres. These structures follow F1 anticlines, dislocating the F2 induced plunging fold closures and thrusting the northern limbs over the southern limbs. A late cross faulting episode produced a set of conjugate fractures, some of which exhibit minor lateral, dextral, or sinistral displacement of from a few to several hundred metres in extent, and occasionally vertical displacement of tens of metres. These structures post-date the early boudinaged quartz veins and were developed as a result of compressional stresses across the regional strike direction, accommodating lateral movement during continued shearing along the fold belt. 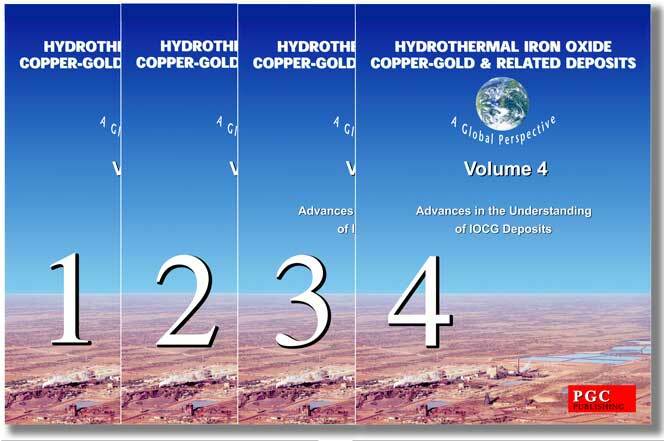 Ore styles - The three main ore styles of the deposits of the Kalahari Copper Belt in Botswana are illustrated by the images below from the Boseto deposit (described later in this record) i). Disseminations and blebs of sulphide (mainly bornite) in arenites (top image); ii). Veinlets of predominantly bornite in more argillaceous rocks, following both bedding planes and fractures (centre image) - note the two main 1 to 2 mm thick veins extending from left to right in the upper half of the image; and iii). Late quartz-carbonate veins with mainly chalcopyrite and pyrite (lower image) - note the irregular bright, 1 to 10 mm aggregates and stringers of yellow sulphides in the lower half of the image, interstitial to the blue-grey quartz and yellow to brown to white carbonate minerals. Photographs by Mike Porter, 2014.
iii). Vein related mineralisation - that occurs in both the D'Kar and Ngwako Pan Formations, and comprises coarse grained sulphides in quartz and quartz-carbonate veins and veinlets, which may also contain K-feldspar, chlorite and sericite, and very rarely barite. The quartz of this stage of veining appears to be massive and translucent, in contrast to the early phase metamorphic quartz which is normally fibrous. Veins are generally 0.5 to 5 cm thick, although rare, larger veins may be up to several metres wide. Fractures, veins and veinlets sometimes increase in density towards the tops and/or bottoms of enclosing lithological units due to rheological contrasts. The highest grades for both Cu and Ag generally coincide with the highest density of structurally controlled veining, which frequently is within marls, especially the lower marl unit, and the black carbon rich siltstone and shale unit of the D'Kar Formation, where vein density typically ranges from 1 to 5 per metre. The lowest vein densities are within the sandstone lithologies of the D'Kar and Ngwako Pan Formations, except in the North East Fold, where a combination of a plunging fold closure and coincident faulting and thrusting has stimulated micro-faulting. Disseminated mineralisation commonly forms haloes adjacent to veins, or extends between fractures which are multidirectional, with interconnected bedding parallel and transgressive orientations, frequently forming stockworks. Sulphide stringers cross-cut the quartz and quartz-carbonate veins. Quartz and quartz-carbonate veining is widely developed, both stratigraphically above and below the main zones of mineralisation, where sulphide minerals are rare, presumably due to a lack of effective reductants available to facilitate precipitation, or depletion of metals from the mineralising fluids. The sulphide assemblages within the Banana Zone are frequently zoned, mostly vertically upwards through the stratigraphic sequence but locally, laterally along strike and possibly up and down dip. This zonation is also influenced by local changes in the oxidation state, chemical characteristics of the lithologies, or the presence of other mobile reductants, and generally comprises; proximal hematite to chalcocite-hematite to chalcocite-bornite to bornite to bornite-chalcopyrite to chalcopyrite to chalcopyrite-pyrite to pyrite-sphalerite-galena. iii). A lower, proximal zone of chalcocite or chalcocite-bornite occurring as coarse sulphides in veins and finer clusters and aggregates in fractures, along cleavage planes or disseminated through the porous lithologies. Irrespective of the zoning pattern or composition of the sulphide assemblage, the structurally related cleavage or vein hosted and disseminated assemblages have the same textures, namely, chalcopyrite, progressively rimmed by bornite and then by chalcocite. The Boseto deposits, which include Zeta, Plutus, Petra, Ophion, Selene, Zeta NE, NE Mango and others are located within 20 km to the NW of the Ghanzi Deposits, in similarly NE-SW trending host rocks at the same stratigraphic position, namely within finely laminated and chemically reduced mudstones and siltstones in the lower sections of the D'Kar Formation, immediately above the contact with the underlying oxidised arkoses and sandstones of the Ngwako Pan Formation. The Boseto group of deposits are located in three parallel exposures of the host unit on the limbs of an adjacent, NE-SW trending, attenuated anticline-syncline pair. Petra and Plutus are on the northern limb of the anticline, distributed over a strike length of ~15 km. The Nexus deposit is distributed over the southern shared limb of the anticline and syncline, ~7 km to the SE, while Zeta and Zeta NE are on the southern limb of the syncline, ~2 km further to the SE. The limbs of these structures dip at 50 to 70°. Copper in the Boseto Project area occurs predominantly in chalcocite, with minor amounts of bornite and other copper sulphides. At shallow depths, malachite and chrysocolla exist in significant proportions within some areas of the mineral resource. 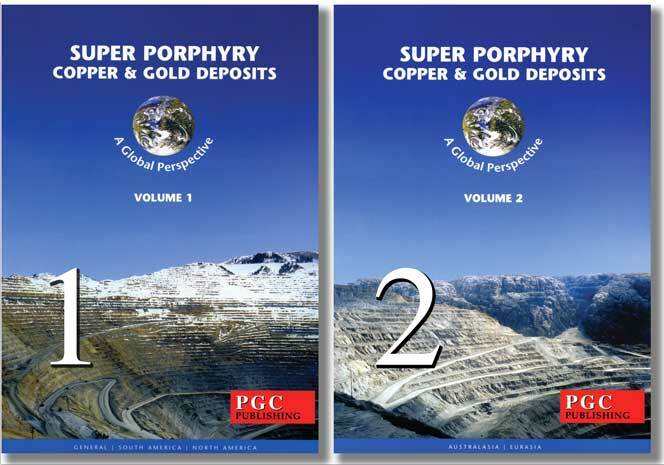 TOTAL Mineral Resource - 18.8 Mt @ 1.5% Cu, 24 g/t Ag. TOTAL Ore Reserve - 15.0 Mt @ 1.3% Cu, 18 g/t Ag. TOTAL Mineral Resource - 100.9 Mt @ 1.4% Cu, 14 g/t Ag. TOTAL Mineral Resource - 76.2 Mt @ 1.2% Cu, 15 g/t Ag. Total mineral resources, all Boseto deposits as listed above - 177.1 Mt @ 1.3% Cu, 15 g/t Ag. The Discovery Metals Limited Boseto mine closed in 2015, and was purchased by Cupric Canyon Capital to be amalgamated with that company's adjacent Khoemacau property. Subsequent exploration of the Mango NE prospect led to the delineation of additional and higher grade resources that became Zone 5 as described below. 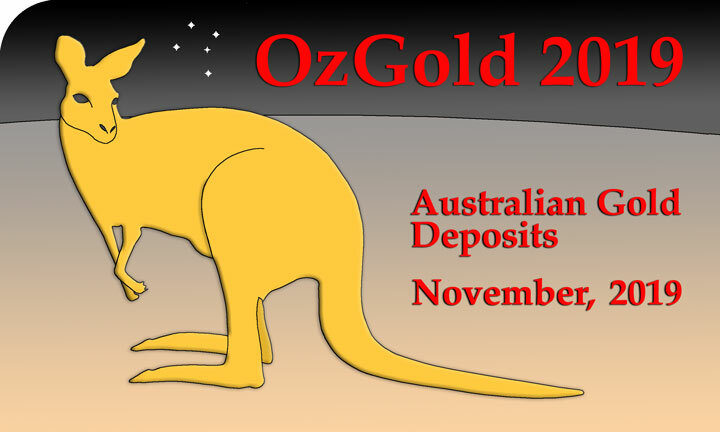 The Zone 5 deposit of Cupric Canyon Capital lies ~12 km SE of the Zeta deposit, and is in the same trend and adjacent to the NE Mango mineralisation listed above. As in the other deposits, stratabound Cu-Ag mineralisation is hosted in the lower D'Kar and uppermost underlying Ngwako Pan Formation. The hanging wall-footwall redox contact between these two units is a distinctive target horizon that consistently hosts Cu-Ag mineralisation. The succession in the deposit area comprises an upward sequence from the sandstones of the Ngwako Pan Formation to the lower marl marker units, followed by calcareous shales to limestone with disseminated bornite and chalcocite, then the main high grade sulphide-bearing zone with >1% Cu overlain by a zone of weak pyrite-sphalerite-galena, further sandstone, and the D'Kar Formation siltstone with interbedded carbonaceous siltstone lenses. This sequence, which represents a thickness of ~150 m, dips at 55 to 60°SE. The main mineralised zone has a strike length of ~4.2 km and has been delineated down dip to an unclosed vertical depth of ~600 m, and average thickness of 9 to 10 m. Mineralisation has been traced to depths of >1200 m. It is masked by 2 to 60 m of Tertiary age Kalahari Group sands. The resource is amenable to both open pit and underground extraction. TOTAL Mineral Resource - 100.3 Mt @ 1.95% Cu, 19.9 g/t Ag. The broad T3 and T20 dome areas are located to the SW of Boseto and cover WSW trending strike lengths of 60 and 40 km respectively in the interval between Boseto and the Botswana-Namibian border. The centre of the T3 dome is ~100 km SW of Boseto, while the centre of T20 is another 100 km to the WSW again. The T3 Dome is immediately to the WSW of the Banana Dome/Zone described in the Ghanzi Deposits section above. These domes all lie within a WSW trending, 15 to 25 km wide structural corridor which MOD Resources and Tshukudu Metals refers to as the Mahumo Structural Corridor. However, they generally have shallowly dipping limbs and are largely masked by superficial cover. The T3 deposit was indicated by a 28 ppm Cu calcrete anomaly, which was followed up with an intersection of 52 m @ 2.0% Cu from 76 m depth. This mineralised zone dips at ~30%°N. It comprises vein, brecciated and disseminated sulphides within a siltstone/mudstone host and as veinlets and disseminations in underlying sandstones. The mineralised zone lies on and just above the contact between the underlying arenaceous Ngwako Pan Formation and the overlying finer clastic rocks of the D'Kar Formation. The transition between the two units commences with the appearance of marl interbeds which provide a marker unit. There is a downward sulphide zonation from chalcopyrite → bornite → chalcocite in the main mineralised sheet, while broad, but variably developed bands of disseminated and veinlet bornite±chalcocite occur 0 to 75 m below in the sandstone with intersections of up to 72 m @ 1.5% Cu, 27 g/t Ag and 13 m @ 1% Cu, 18 g/t Ag 200 m along strike. The localisation of the upper mineralised zone apparently has a strong structural association with shallow thrusting above or near the sandstone-siltstone contact. TOTAL resource - 60.155 Mt @ 0.98% Cu, 14 g/t Ag.